Tommie dePaola’s Oliver Button is a Sissy (1979) tells the story of a little boy bullied at school and discouraged at home because he doesn’t enjoy typical boy things like playing ball. Oliver would rather be picking flowers and playing with paper dolls. Realizing their son is not going to take up football anytime soon, Oliver’s parents enroll him in dance. He is so good his teacher recommends he enter a local talent show. Although he doesn’t win, he builds some confidence and his parents learn to be proud of him for the things he is good at, not the things they wish he was good at. In other words, when he takes the stage, they are better able to see him. The kids at school seem to have a change of heart as well. In 2019, images of gender expansive children are available in several children’s picture books, including Cheryl Kilodavis’s My Princess Boy and Christine Baldacchino’s Morris and the Tangerine Dress. To a lesser extent, characters who embrace a clear camp aesthetic have also made their way to children’s picture books like Lesléa Newman’s The Boy Who Cried Fabulous and Helga Bansch’s Odd Bird Out. However, in 1979 dePaola’s book provided children with a new way to imagine being a boy, uncoupled from rough-and-tumble masculinity. 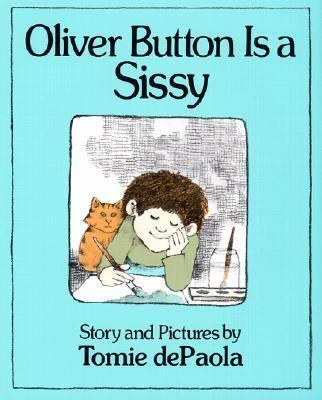 Although it’s forty-years-old as of 2019, Oliver Button is a Sissy has aged quite well. Narrow visions of masculinity still shape playground gender policing and parents are still too often slow to embrace effeminate sons. DePaola tells the story in an accessible style sure to engage young readers. His illustrations pair well with the story, showing what he tells in words. I highly recommend this as an addition to personal and school libraries. Oliver is more subtly gender nonconforming than the children depicted in more recent books, which provides an important representation for children who might like dolls, but not so much dresses.